Narssap Sermia is a calving tidewater glacier in southwest Greenland. This glacier had a stable terminus from 1970-2000. 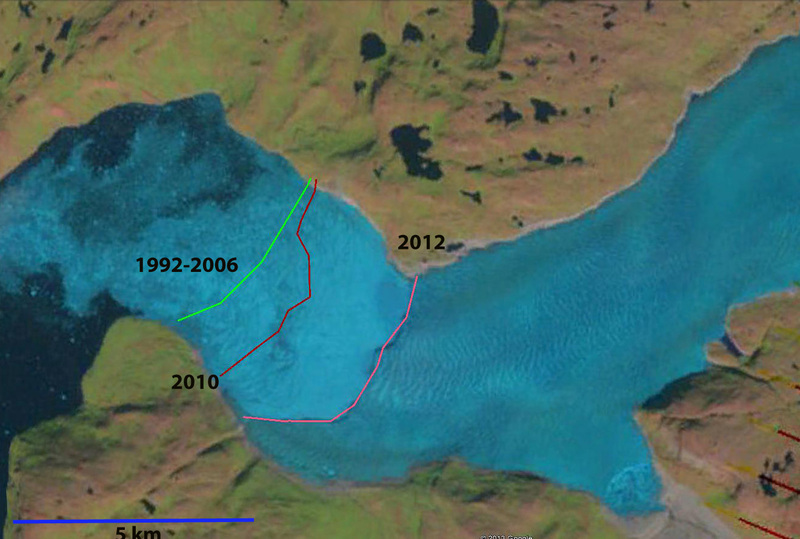 From 2006 to 2012 the glacier has begun a significant retreat. 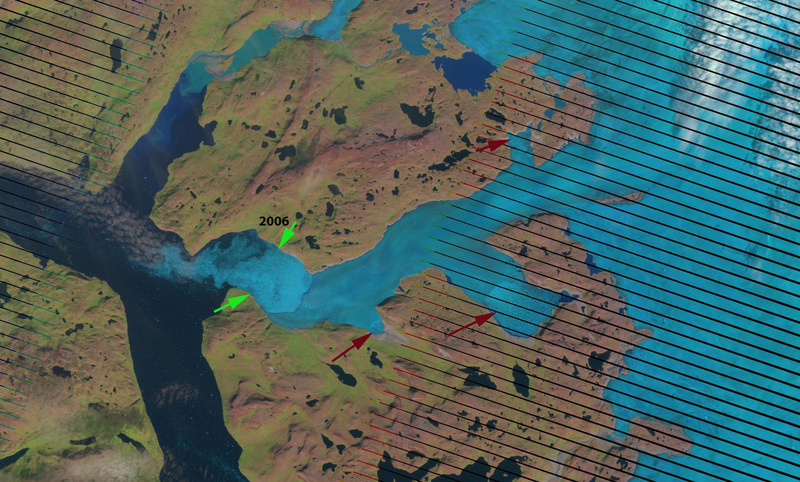 Rignot et al (2006)and Joughin et al (2010) noted that the glacier sped up dramatically in 2005 and 2006 at the time of the retreat initiation. This was an acceleration of at 150%, and the retreat from 2000-2010 was 500 m (Howat and Eddy, 2011). An examination of Landsat images from 1992 and 2012 and Google earth Imagery from 2006 and 2010 document the initiation of this retreat. 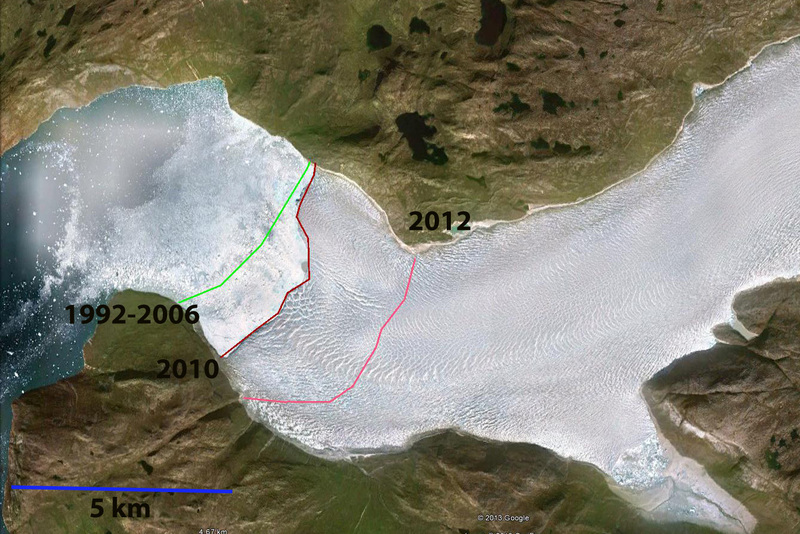 In 1992 the glacier nearly reached the tip of the Peninsula, green line marking the terminus position. 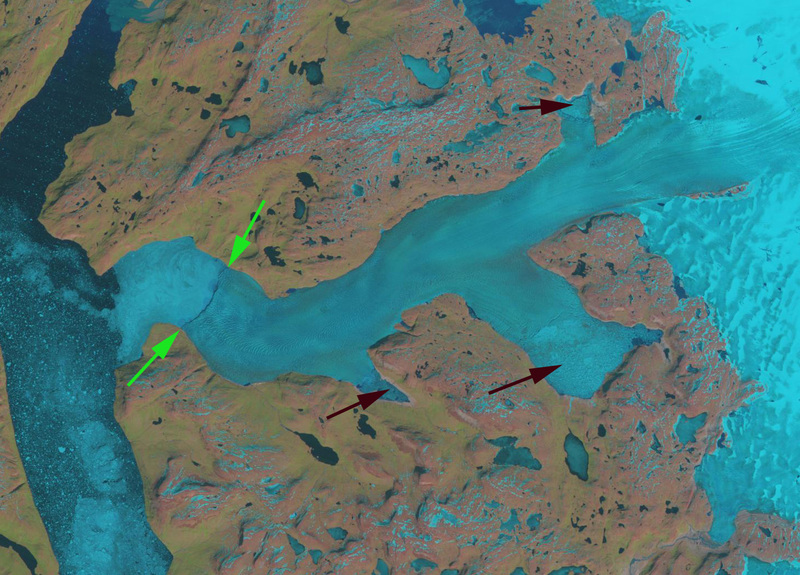 The burgundy arrows indicate proglacial lakes that are dammed by the glacier for a period each summer. 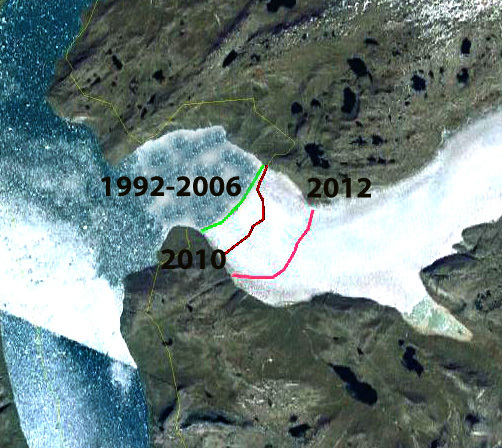 In 2006 the glacier is still in the same location as in 1992. In the 2010 Google Earth image the glacier has begun its retreat from the green to the burgundy line, this is 1.3 km on the south side and 200 m on the north side. In 2012 the terminus has retreated to the pink line that is a retreat of 3.1 to 3.4 km. The terminus on the north is now at the point where the glacier turns due east-west. This is similar to the retreat of Kangiata Sermia just to the south and Kuusuup Sermia. In a future post we will examine the snowline variation on Narssap Sermia. Pictures below in order are from 1992, 2006, 2010, 2012 and 2012. This entry was posted in Glacier Observations and tagged narssap glacier retreat, Narssap Sermia retreat. Bookmark the permalink.